Would you like to distribute My Key Ring! pre-populated with your websites? Great for distribution to attendees of conventions/seminars with sponsor information, etc. Click here now! Now compatible with Vista and advanced Window security rights. Quality. My Key Ring! 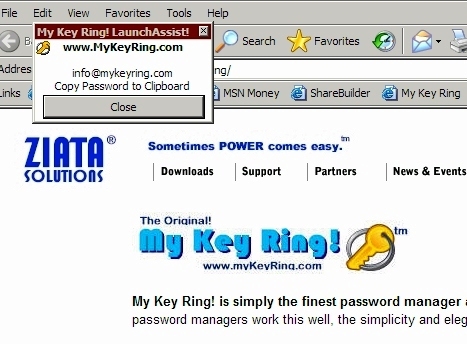 is simply the finest password manager and electronic key ring computer software available! See features and FAQs. Registered users only click here. Registration. From the 5-star authors of Ziata! We developed My Key Ring! to operate in a straight-forward manner. No password managers work this well. The simplicity and elegance of the user interface are compelling. At all points or operation, you will find the look, feel and operation of My Key Ring! to be at the highest level of craftsmanship. No more wasting time trying to manage passwords. Never forget a password or user name again. Save your energy, time and money. My Key Ring! manages passwords easily and automatically! The frustration of trying to manage passwords, manage account numbers, manage website addresses and user names is gone! Your electronic key ring is finally here! Ease of Use. See the screenshot of the software. All of your information is there for you in a very familiar and friendly format, similar to your email package format: categories and subcategories on the left and a filtered and sorted listing. You can flag certain items as frequent, you can create unlimited categories and subcategories, drag and drop, etc. We use our proprietary "double vault"tm protection on your password information with double encryption. There is no password manager available with this level of power and easy of use, at any price, anywhere! It's friendly, familiar and powerful. Free Single User. You can download and use My Key Ring! in single user/database mode for FREE. It will not expire. Registration is not required for use of this version of the product. Registration is requested and is required for support, upgrades and updates. NO RISK! If you register, you receive even more benefits with the Bonus version. Version: 4.4. Subject to the terms of the license agreement, this version of the software will operate in single user mode without registration or any payment. New Users: Complete information below, and click the Download Now button. Updates: Click Here. Registered users only click here. Now with Password Generator, AutoFill!, SmartLookup!, Import/Export, AutoUpdate!, LaunchAssist!<tm> and LiveMenu!<tm> See what you can do!. Use LaunchAssist! for those situations when AutoFill! is not available because the website uses graphic logins, Windows 2000/3 logins or other non-form based logins. LiveMenu! is your easy access to the power of My Key Ring! 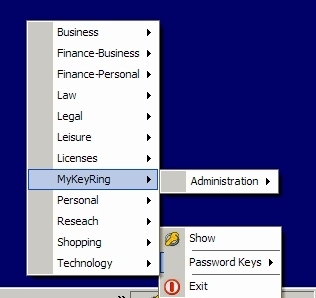 Sitting in the System Tray in the lower right corner of your screen, you can easily access menus and your password keys. Generate unique passwords, using letters, numbers and symbols. Since My Key Ring! 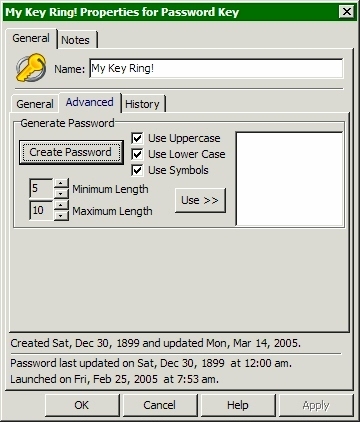 can track histories of changes, you never have to worry about tracking back to prior passwords. The databases and passwords in the database are encrypted to protect your valuable information. You can track all of your passwords, bank account numbers, user id's in one place. If you are an administrator, you can even create categories and subcategories for departments and employees, computers and software, etc., so you can finally track employee passwords, machine numbers, software license codes, etc. All organized. All in one place! You can even view My Key Ring! in a small mode that will float on other programs. So many options to tailor specifically to you! Beauty and Elegance. Friendliest, most straight-forward, and most powerful interface available, anywhere at any price. Power is nothing unless it is accessible. My Key Ring! is better than ever. Network ready. Registration allows for multi-user access and streamlined logon operations. Unlimited number of databases, you can have separate password files for each member of the family! Or, you can share one password file with multiple people who need simultaneous access, such as at work. For large businesses, upgradable to the enterprise version. All Unlimited. Unlimited password keys, categories, subcategories, databases (separate password files), etc. Excellent features and quality. Site Licenses, Enterprise Edition Available. Pad Info. Contact us.